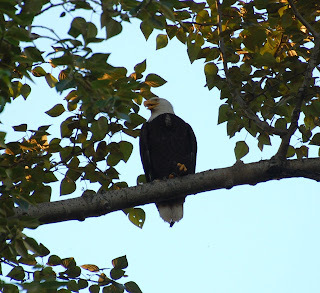 This bald eagle is watching over its two fledglings that have left the nest, but are not yet strong enough to fly. We spotted them on the grounds of Talaris, a privately-owned 18-acre campus near the University of Washington. The site is undergoing consideration for rezoning, with a proposed plan to develop a mix of apartments and townhomes while retaining the overall open character of the site. If that fails, the developer will subdivide it (no rezoning necessary) into boring 5000 sq ft single family lots. The planning hearing is set for Jul 12th!